Sibling rivalry reaches new heights in this delightfully tongue-in-cheek picture book that’s perfect for fans of Lauren Castillo’s The Troublemaker. Hannah Barnaby’s humor and spare text are brought to life by Mike Yamada’s bold illustrations in this charming picture book about the special bond between brothers and sisters. Hannah Barnaby is the acclaimed young adult author of Some of the Parts and Wonder Show, which was a 2013 William C. Morris Award Finalist, a 2013 YALSA’s Best Fiction for Young Adults selection, and one of Kirkus Reviews’s Best Teen Books of 2012. 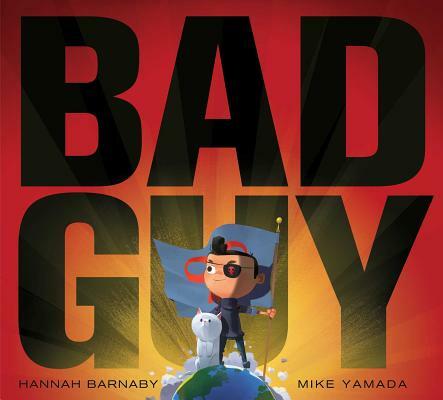 Bad Guy is her debut picture book. Visit her at HannahBarnaby.com. Mike Yamada is a concept designer, illustrator, and design consultant based in Pasadena, California. Mike has contributed to the development of many animated films, including Puss in Boots, Kung Fu Panda 2, How to Train Your Dragon, and Big Hero 6. Mike is the author and illustrator of Cool Cat Versus Top Dog, as well as the illustrator of Bedtime Blastoff and Kai to the Rescue. Learn more at MYamada.com. "A fun read-aloud for storytimes, this is an amusing and clever tale, enhanced by lively illustrations, that will be a good choice for most shelves." "It's sibling rivalry with a twist."